In the mid-eighteenth century, the British historian Thomas Birch (1705 – 1766) published a series of short biographies of famous figures from his nation’s past. Accompanying each of the 108 biographies was an engraved portrait of the subject, whose likeness was presented within an elaborate decorative setting. These ornamental frames were designed by Hubert-François Bourguignon (1699 – 1773)—commonly known as Gravelot—a Parisian artist then working in London. Gravelot was an important early proponent of the Rococo style in Britain, and several elements found in the present drawing, such as the scrolling banderole and curving natural forms, attest to his artistic interests. This particular setting was created to showcase the portrait of Sir Walter Raleigh, a renowned courtier, adventurer, and author who was executed outside the Palace of Westminster on October 29, 1618. Details about Sir Walter’s life and death are incorporated into the frame’s design. Once a favorite of Queen Elizabeth I, Sir Walter was beheaded for conspiracy against her successor, King James I. In the final moments before his death, the condemned nobleman reportedly requested permission to examine the executioner’s axe. His wish granted, Sir Walter returned the weapon, remarking wryly that here was “a sharp medicine…a physician for all diseases.”  Afterward, his wife Bess was presented with her husband’s head, which she is said to have kept as a memento; this gruesome token can be seen in the right foreground of Gravelot’s image, lying beside the axe that separated it from Sir Walter’s body. A book, baton, anchor, and globe offer more pleasant reminders of his accomplishments as an author and explorer. The design process was collaborative, and careful examination of Gravelot’s drawing reveals evidence of multiple creative points of view. Dutch writing, faint but legible, appears within the oval space originally left blank by Gravelot. 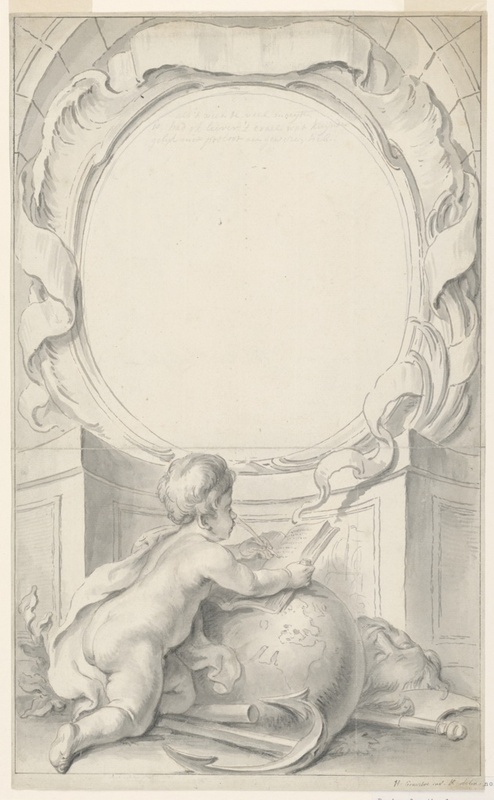 Here the engraver Houbraken has added a note remarking that if not too much trouble, he would prefer the oval somewhat smaller, “as I have indicated in pencil.” And, indeed, a correction in graphite can be seen running along the interior arc of the central oval, reducing its size. It seems the change was not too difficult after all, as Houbraken’s alteration to Gravelot’s design is quite clear in the final engraving—now that we know to look for it. The portraits, issued first in small sets beginning in 1737, were later published in a single volume by John and Paul Knapton, as The Heads of Illustrious Persons of Great Britain, Engraved by Mr. Houbraken and Mr. Vertue, with their Lives and Characters by Thomas Birch, A.M.F.R.S (London, 1743-1752). Robert Halsband, “The Rococo in England: Book Illustrators, Mainly Gravelot and Bentley,” in The Burlington Magazine, Vol. 127, No. 993 (Dec., 1985), 870-880. Mark Nichols and Penry Williams, Sir Walter Raleigh: In Life and Legend (London: Bloomsbury, 2011), 320. The portrait of Raleigh in Houbraken’s engraving is based on an unknown artist’s painting in The National Portrait Gallery, London.